On this date in 1915, twenty activists of the Armenian Hunchakian political party were publicly hanged in Istanbul’s Beyazit Square. A couple of other very grainy (newspaper?) images are here. These unfortunates had participated in a 1913 convention that resolved — secretly, so they thought — upon treating to a programme of political assassinations of the nationalist Young Turks then driving belligerent policy against Armenians. Unfortunately for them, the Sublime Porte had sublime ears. * It pounced on the prospective terrorists at the first opportunity, and gave them a couple of years in a dungeon before a wartime show trial days just days after Armenian genocide had commenced. Paramaz, who’s probably the most individually famous of the twenty, has a recently-erected monument in Meghri. He’s also credited with a movingly humane exchange with an Ottoman judge, each reflecting on their respective impasse vis-a-vis nationhood and self-determination. “The attributes of history in our reality are arranged in such a way that what constitutes ‘patriotism’ for one is viewed as destructive treason by the other,” quoth the judge (!!!) to the defendants. And thus the mutual relations between nations living together amount to the negation of international law and social concepts. Today is the last session of these trials … There was something unusual and unqualifiable in these trials. Unqualifiable because neither you nor us had enough wisdom to penetrate each other’s [worlds]. You cannot imagine, effendis, that it is with such grief that I will pronounce the depth of my conviction regarding the patriotism accumulated in you. What can be more heartbreaking tht warm blooded beings like you full of life have sacrificed logic to sentiments … What great deeds vigorous individuals like you could have accomplished, if the ideal of a common welfare had been pursued under one banner … What benefits could have been borne from a mutual understanding that eluded [us], the other end of which is sad and dark. You languished with the idea that you are struggling against injustice; while have felt, every minute, that the rules of the world are abasing higher tendencies under the weight of cruel necessities. I, who has never cried in my life … I am not ashamed to say that I was deeply moved by the sincerity of [the judge] Khurshid Bey’s speech … and I cried, I, Paramaz, because Khurshid Bey put his finger on the wound when he stated, ‘What good deed could have been accomplished …’ I cried because in those words I found the brilliance of truth. Gentlemen, judge people by their work, by their traditions, within the realm of their ideas. I am not a separatist from this country. On the contrary it is [this country] that is separating itself from me, being incapable of coming to terms with the ideas that inspire me. Mutual empathy notwithstanding, the end for these twenty was indeed sad and dark. * An Armenian informant named Arshavir Sahagian attended the conference and finked out its design. He was killed for his troubles on December 25, 1919, according to Raymond Kevorkian. 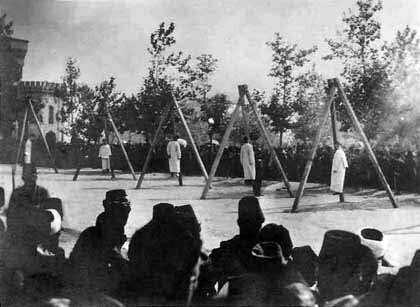 Ninety-one years ago today,* the tottering Ottoman Empire hanged one of its officials in Istanbul for his role in the mass slaughter of its Armenian minority during the First World War. 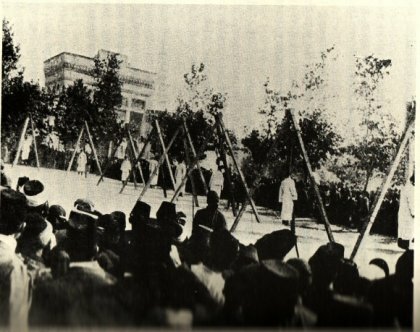 Kemal Bey’s hanging in Bayezid Square occurred in the immediate aftermath of the Great War. Here, on its last legs, the remains of a sultanate splintered apart in the war instituted tribunals for wartime offenses by the Young Turks who had run the government during the war — a sop to the British occupying forces making worrying noises about international trials for much bigger fish. These “Three Pashas” who had driven Ottoman policy during the war had fled abroad. They would be condemned to death in absentia, and though none would hang, neither would they outlive Mehmed Kemal by as much as four years. They were among the many unpunished perpetrators of the slaughter hunted down by Armenian assassins. The latter two were avenged by Operation Nemesis; Enver Pasha died in battle in Tajikistan during the Russian Civil War. Events would soon outstrip these tribunals and lay waste to all parties’ plans for the Ottoman carcass, incidentally leaving the Armenian issue permanently unresolved. The month after Mehmed Kemal swung, western allies went one dismemberment too far by backing the irredentist Greek state’s landing at Smyrna — an intervention that was to backfire catastrophically for the Greeks, and help birth the Turkish Republic. * A few secondary sources say April 12 rather than April 10, but the earlier date appears much better attested.